In the picturesque region of Emilia Romagna in the northern Italian countryside, Paolo Farabegoli’s family owned a house with a few sheep. His grandmother, the matriarch of the family, was not only an excellent cook, but a terrific cheesemaker with an affinity for aging cheese. Paolo remembers his grandmother making the cheese from the sheep on their small farm and hiding the cheeses in barrels. She would cover them in hemp in order to keep them as long as possible, and every few days she would come back to re-cover them with new hemp leaves. After a few months, she would rub the rind with unfiltered linseed oil to keep it soft, changing the leaves twice a week to keep the cheese under constant humidity and temperature. This process took approximately three months, after which she would use the cheeses for bartering. Today, Paolo has revived his grandmother’s cheese making tradition. Still made from sheep’s milk, the cheese wheels are then covered in hemp leaves and linseed oil and left to age in virgin fir crates. 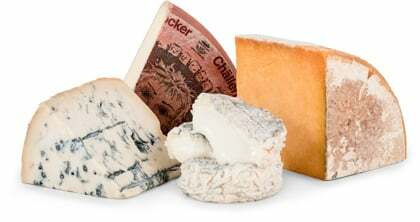 This unique maturation process gives the cheese a unique scent and flavor while maintaining its softness. 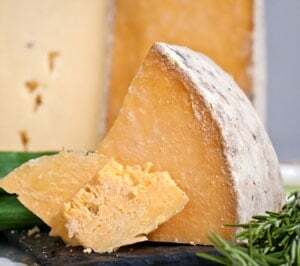 The result is a semi-firm cheese which imparts a subtle herbal flavor without screaming of hemp. This eye-catching cheese is handcrafted from pasteurized sheep milk and aged for a total of at least 90 days. Semi-firm, it resembles a slightly crumbly paste that is buttery and savory with a mild herbaceous finish. Try shaving atop roasted vegetables and on salads, or keep it simple by pairing it with a good bread and a drizzle of olive oil. It also makes a fantastic edition to any cheese boards with crisp fruits such as apples or pears. For beverages, try pairing it with acidic white wine (such as Vernaccia) or hoppy pale ale. As always, allow the Pecorino alla Canapa to reach room temperature before sampling, and please note the rind is inedible, so remove before enjoying.